How much does UFH cost? What are the different types of UFH? What kind of insulation does UFH need? Is UFH the best option for my home? Can I combine UFH and radiators? How easy is UFH to control? 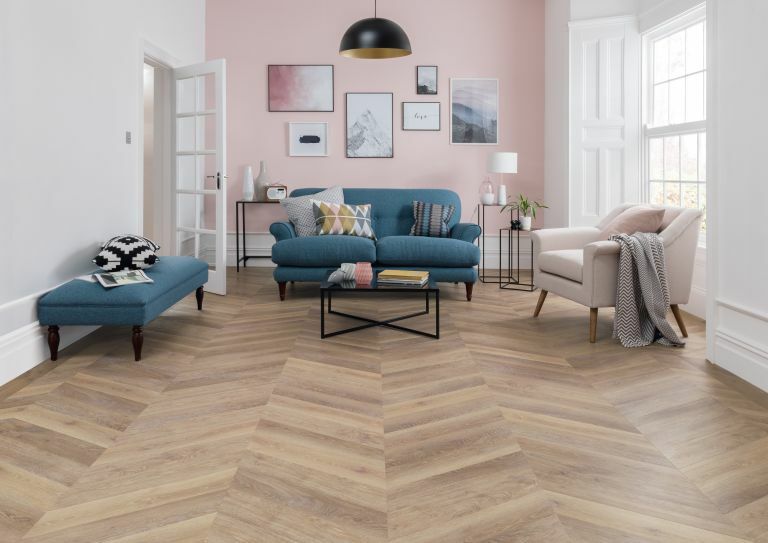 Which types of flooring are best with UFH? Does UFH come with a warranty? Are there any other invisible heating systems? Underfloor heating (UFH) has plenty of benefits. It’s a treat for bare feet, makes room layouts more flexible as there are no radiators to take up wall space, and can be a cost-efficient way to heat your home. It also works really well with renewable heating sources, so will be the perfect choice for anyone trying to make their home more sustainable. It sounds ideal – but how do you know if it is the right way to heat your home? What types are there? Can you retro-fit it? How much does it cost to install? Is it expensive to run? Does it only work under certain types of flooring? Whatever your underfloor heating query, find the answer in our expert guide. Underfloor heating comes in two types. Wet, which is so called because hot water is pumped through pipes in the floor, or dry which is the name used for electric systems that run off the mains. Wet systems are fed off hot water often heated by a boiler, but also work well with renewables such as solar thermal panels or heat pumps. Both methods heat the floor and take advantage of the fact that hot air rises, heating the room in the process. You can compare the benefits of wet and dry systems below. How much does underfloor heating cost to install? Expect to spend upwards of £100 per square metre for water systems and from £50 per square metre for electric, excluding preparation, underlay and installation. Bear in mind that electric systems are far less expensive to install for areas up to 20m2. Warm water UFH systems generate temperatures of 40°C to 65°C, meaning that the actual floor temperature will be on average between 23°C and 32°C. This is lower than standard radiators, so heating costs should be reduced over time. Compared to a radiator-only heating system, UFH is estimated to be 25 per cent more efficient when paired with a modern condensing boiler, and up to 40 per cent cheaper when combined with a heat pump. Electricity has higher unit costs, so these systems may prove a little more expensive. However, timers can be used to optimise performance. As electric UFH is independent of the central heating system, it allows you to warm a specified floor without having to heat the entire house. What are the different types of underfloor heating? There are two main types of underfloor heating systems: warm water – or wet – underfloor heating, which runs through pipes as part of the heating system; and electric. Warm-water systems involve burying 1.6cm pipes into the floor screed. The screed is then finished in your selected covering and the zoned system controlled by a manifold, usually located in a store cupboard. Rather than radiators emitting heat, the whole floor slab does so. Pros: Most energy-efficient way of delivering UFH. Low running costs. Cons: Requires a complete overhaul of the existing floor structure and so best suited to extensions or new builds. If you don’t want to dig out the floor structure, consider underfloor heating systems from companies such as Nu Heat and Polypipe. These consist of insulated panels with channels routed out for 1.2cm pipes to sit in, which can be laid on top of the existing floor structure. The panels add as little as 1.5cm to the floor height and use warm water in the same way as the buried systems. Cons Relatively expensive and adding this system to selected rooms that are part of one storey of a home will cause level changes between the spaces. An electric system avoids the need to raise floor levels in existing rooms, and is a popular choice for heating single rooms. Electric systems consist of matting on to which cables connect into the home’s electrical circuit. It is operated via thermostats. Electric UFH mats are slim and can be laid within tile adhesive, making them very popular for bathrooms. Pros Easy to retro-fit. Ideal for individual rooms. Cheap to install. Cons Relatively high running costs compared to water systems. As electric systems are installed directly under the floorcovering, and work independently from your central heating system, they are particularly useful for one-room installations or where the sub-floor level is already set. The wire or matting systems are very thin (around 3mm) and shouldn’t cause problems with differing floor levels – thus creating little disruption to the existing room. Wet systems circulate warm water through plastic pipes installed underneath the floor and are connected to the main central heating source. This system tends to work best when the pipes are embedded in a screed, as this helps dissipate the heat, so it is suited to new floor constructions where the sub-floor can accommodate the pipework and cement screed. Wet systems are therefore more likely to be used in new-builds and extensions or during major renovation work. What kind of insulation does underfloor heating need? The type of insulation you require will depend on the kind of system you have chosen. For ground-floor rooms and renovation projects with a solid floor construction, UFH systems will need to be laid directly onto pre-installed foam or polystyrene-type insulation, in order to meet building regulations. There are also systems for solid floors that incorporate insulation into their system design, such as Polypipe’s Floating Floor System, which features high-density polystyrene floor panels that provide the base for the heating pipes, but also enhance insulation. For rooms upstairs, the insulation you require will once again depend on the product you have chosen. These slightly trickier installations require underfloor heating systems that can be installed on to floors without a solid base, often on suspended timber or battened surfaces. Here, we would always recommend using a solution that incorporates insulation into its design, so you can be sure that the insulation is the perfect fit for your system’s requirements. For example, Polypipe’s Suspended Floor System features insulation specifically designed to fit between supporting joists, while the Modular Heating Panels solution is a system made up of pre-configured panels with 3cm of insulation already built in with the panels able to be simply connected and then installed between joists on site. Is underfloor heating the best option for my home? UFH is particularly effective for large open-plan spaces – especially those with high ceilings – as the entire floor radiates heat upwards warming feet and creating even room temperatures. This radiant heat also means reduced draughts, moisture levels and airborne allergens. Typically underfloor heating is more than enough as a standalone form of heating. However, its capabilities will often be dictated by other factors, such as floor coverings (see below) and a building’s insulation levels (especially walls and windows). This is why heat-loss calculations are so fundamental, and the building’s individual thermal performance will indicate how much heat you need to generate. For example, a poorly insulated room with lots of glazing may not heat fully when it is cold outside (which means additional insulation or supplementary heating may be necessary). There is a limit to the floor temperature an underfloor heating system can operate at comfortably, so this can mean it’s not suitable for very small rooms where the ratio of floor area to room volume is low. Underfloor heating is a good choice for heating your kitchen, especially an open plan, living kitchen. It works well with hard flooring often used in a kitchen and means you can use wall space for storage instead of radiators. Is underfloor heating suitable for an old home? UFH can be a sound choice for an old house. However, it’s not suitable if a historic floor would be damaged, or the foundations undermined. Remember also that concrete floors and damp-proof membranes may upset the equilibrium of the structure, causing damp problems. An alternative, breathable option is Limecrete. This works particularly well with underfloor heating and includes a compatible layer of insulation. Bear in mind, too, that UFH may not have sufficient output to heat a large old property with little insulation. Can I combine warm water underfloor heating and radiators? A combination of both systems can be the answer for many homes, as radiators can be easily incorporated into an underfloor system. A good compromise is to install underfloor heating on the ground floor, with radiators upstairs to accommodate the different requirements for living and sleeping spaces, especially as many people still want heated towel rails in their bathrooms. How easy is underfloor heating to control? Specialist UFH controls are vital to ensure comfort, responsiveness and energy efficiency. Underfloor heating takes longer to heat up and cool down compared to radiators, so to overcome this time lag, programmable controls are essential. For households with irregular or limited occupancy and for holiday homes, it is useful to have remote control so that you can turn the heating on an hour or two before arriving. Remote control is also useful if you forget to turn the heating off. Your heating engineer or UFH supplier will design the system for you, matching the output per square metre to the heat requirement of the room, based on volume, heat loss characteristics of the walls, floor, roof, windows and ventilation, and your choice of floor covering. Which types of flooring and sub-flooring are best with underfloor heating? The best type of floor sub-structure is one made from screed that fully encapsulates the pipework and provides a dense and conductive medium for the spread and emission of the heat flowing through the pipes. This then allows a lower temperature of pipe to be used, typically around 35°C, and makes for a much more efficient UFH system. Solid floor coverings – including stone and ceramic – are the best choice for the flooring over the top and will provide good heat output. If you prefer solid timber flooring, always check with your supplier to ensure it is suitable for use with UFH, or consider engineered timber boards that, due to their construction, tend to be more stable during changes in temperature. Again, check with the supplier to make sure your particular choice is recommended for use with UFH. In both cases, bear in mind that surface temperature shouldn’t exceed 27°C. Most top-of-the-range laminates and vinyls can also be used with UFH. Carpets can be used with UFH. Check out the combined tog rating of carpet and underlay, though. It should be less than 2.5 tog so the underfloor heating system can operate efficiently. What's the installation process for underfloor heating? Electric underfloor heating systems can easily be installed by a competent DIYer, although the majority of projects are still completed by a contractor, such as a tiler or electrician. Most UFH systems are laid on insulation with a screed covering. In this situation, laying the pipework and connecting the manifolds can be carried out by any competent person. If you’re doing this yourself, your chosen company should provide pipe layout drawings for you to follow, along with installation manuals or videos covering a similar project. It is simply a matter of following the pipework drawings – running each individual circuit from the manifold, clipping the pipe to the floor with the provided staples, and then returning the pipework to the manifold. All installations should be tested before the final floor finish is laid. A qualified installer is needed for electrical or gas connections. Standard UFH systems are 15cm-16.5cm in depth, comprising 10cm of insulation, 5cm-6.5cm of screed containing the warm water or electric heating elements inside, followed by the floor finish. Unless a nail is accidentally put through the pipes at some stage, this simply does not happen. There are no joints in the floor and the pipes are designed and tested to have a 50 year life expectancy at temperatures and pressures that exceed those required by the system. If accidental damage should occur, individual pipes can be pressure tested to locate the correct one. In timber floors, the pipe can usually be exposed to allow for repairs, while screed floors will need to be excavated to uncover the pipe. When it comes to electric systems, it is simply a case of lifting the floor covering and replacing the damaged circuit. Does underfloor heating come with a warranty? Look for systems that come with an extended warranty as standard. Wet systems consist of various components, and you may find different lengths of warranty are offered on each part – for example, 25 years on pipes, but perhaps two years on the manifolds. As a general rule, manifolds are simpler to replace than pipes, so a long warranty on the pipes themselves is highly desirable. With electric systems, extended warranties are usually in the order of one year for the thermostats, which are easily replaceable, and 10 years for the heating cables, which are not. Lifetime warranties are also available with some brands. When looking at warranties, do ensure that the company backing it has some substance. A number of online companies have sprung up offering extended warranties on their systems, but if they are no longer in existence when the system fails then that warranty will be worthless. Where cost is an issue, the expense of installing underfloor heating may outweigh the advantages, especially if it involves removing concrete floors and re-screeding. In houses not occupied during the day, underfloor heating’s slow warm-up and cooling time (which can be up to four to six hours) may not suit you. A combination of both systems can often be the best answer for many homes, as radiators can be easily incorporated into an underfloor system. A good compromise is to install underfloor heating on the ground floor, with radiators upstairs to accommodate the different requirements for living and sleeping spaces, especially as many people still want heated towel rails in their bathrooms. Are there other invisible heating systems? As an alternative to underfloor heating, you could consider both skirting board systems and wall panel heating. Wet or electric skirting heating systems are a great option. Wet systems can be used with heat pumps as well as conventional boilers due to their large surface area and the even distribution of heat around rooms. Direct electric versions are easier and simpler to install into properties with no existing gas or pipework, but are more expensive to run. However, their fast response times and even heat distribution does offset some of the additional costs when compared to other forms of electric heating. Installation of a skirting board heating system in a typical two bedroom semi-detached house would cost upwards of between £3,600 and £6,000, although cheaper, DIY supply-only options are available; expect to pay upwards of £500 to £720 per room. Variotherm modular wall and ceiling heating panels are a solution for rooms where underfloor heating is not an option, whether in renovations or new builds. They are easily adaptable for walls, sloping ceilings and complex roof structures. Full systems start from £70 per square metre, including the manifold, boards and controls, at supplier UFH1.